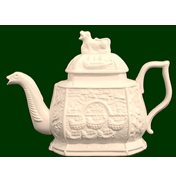 Here you will find a range of delightful Royal Creamware Teapots. The first in the series features moulded relief depicting the victories of Admiral Vernon at Portobello in 1739 and Fort Chargre in 1740. Vernon captured Portobello (sometimes written as two words - Porto Bello), which was a Spanish colonial possession on the Panama Peninsula in the South Americas. Admiral Vernon boasted to Parliament that he could take Portobello with only six ships, which in actual fact he achieved, and as a result of which, he was granted the Freedom of the City of London. The content of detail depicted on the teapots here is taken from medals to commemorate the victories. The second in the series is cylindrical heart shaped in plan. Moulded on the body and lid are grape vines, which are traditionally incorporated in romantically themed pottery of the period. The spout features an animal’s head and neck with embossed serpent and human face. This teapot is patterned from an earlier teapot made by John and Thomas Wedgwood Staffordshire early the 1750’s. The Wedgwood family figured highly in the development of the Potteries from their home at ‘The Big House’ in Burslem with branches of the family also seeking to move into the family trade. With Josiah Wedgwood Thomas's son proving by the age of nine, that he also was a skilled potter, he eventually set up his own pottery works in Burslem too. The third in the series takes the form of a three-storey house moulded to one side with ‘The Arms of England’ and the ‘Arms of Holland’ to the reverse. The arm shaped spout is moulded with serpents and masks and features a notched handle. 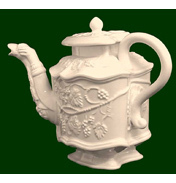 The teapot is reproduced from a mould of a teapot made by John and Thomas Wedgwood circa 1745. Whichever teapot you choose you are sure not to be disappointed.